Bhauma Pradosh Vrat Importance - How to Observe Bhauma Pradosh? When the Pradosh Vrat day falls on a Tuesday it is known as Bhauma Pradosh. Bhauma is another name of planet Mars or Mangal. Bhauma Pradosh 2019 dates are April 2. The days is of great importance as Pradosh tithi is dedicated to Shiva and Tuesday is dedicated to Hanuman. It is believed that all forms of sins and dosh (blemish) are destroyed by fasting on the day. Pradosh, or Pradosha, is an auspicious day dedicated to Lord Shiva and it falls on the 13th day of every lunar fortnight in traditional Hindu calendar. Shiva devotees undertake a fasting from sunrise to sunset on the Pradosham day. Mangal or Mars is the presiding deity of Mangalwar or Tuesday. All sins and blemishes are destroyed. Those facing problems due to bad position of Mangal Grah will get relief. 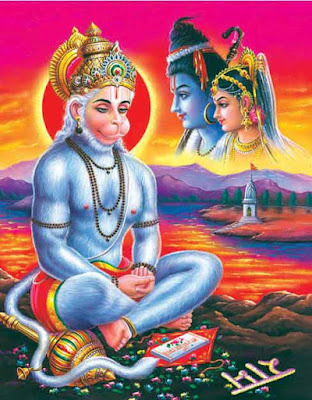 Victory over enemies with the blessing of Sankat Mochan Hanuman. How to Observe Bhauma Pradosh Vrat? Fasting from sunrise to puja after sunset. After taking bath in the morning offer prayers to Ganesha. The perform puja and prayers to Shiva. Offer prayers to Hanuman and Chant Hanuman Chalisa. Sabudana Khichadi, fruits and milk can be consumed on the day. Chant Shiva mantras or read stories of Shiva. A person can perform donation of red color clothes, masoor dal, jaggery and vessel used for carrying water. If possible visit a Shiva Temple. In the evening during Pradosh period, just before sunset. Perform puja to Shiva and Goddess Parvati. During the evening puja, boondi ladoo should be offered to Hanuman and then distributed as Prasad. A person can end the fast after puja by partaking the Prasad. How to observe Pradosha Vrata?